On March 28th 2013 Born to Run Race Director Matt Rogerson will be setting off on what is the biggest challenge of his life – so far, the I Am Premier League Challenge . Setting off from St James’ Park, home of Newcastle United Matt plans to run around the grounds of the 21 most successful Premier League sides of all time finishing at “the Mecca of World Football, White Hart Lane,” on April 20th – just in time to run the Virgin London Marathon on April 21st. Matt estimates that the run is approximately 700 miles in total – around 30 miles a day. Matt will be raising money for three charities aiming to raise £50,000. 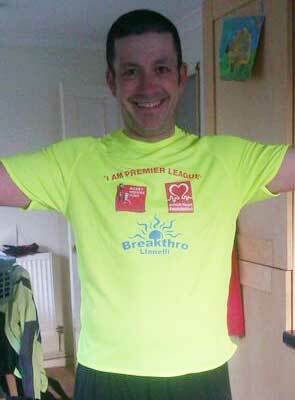 Breakthro Llanelli, The Bobby Moore Fund and the British Heart Foundation. One Response to "Matt Rogerson – The I Am Premier League Challenge"
All the very best,Matt. Good Luck!!! !